A colony of nearly 1500 seals inhabits nearby Chimney Beach, which is protected from binocular-wearing tourists by tall cliffs. But Drakes Beach, with its wide swath of sand and spectacular views of the Pacific, has been claimed by humans. Park officials have used a decidedly low-tech method to enforce an armistice between the mammal species: They waved blue tarps to annoy the seals away from the areas most popular with the homo sapiens. 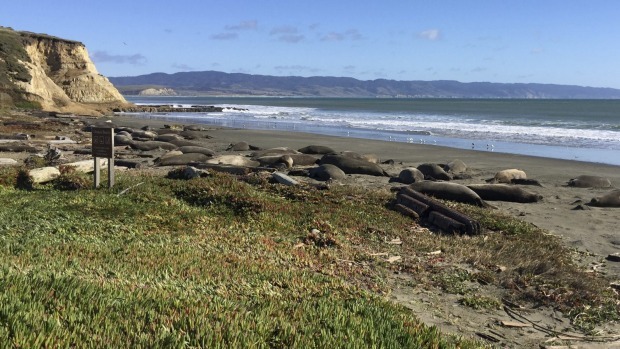 "Drakes Beach and its access road from Sir Francis Drake Boulevard are temporarily closed to all vehicle, foot, and bicycle traffic due to elephant seal activity in the area." A few have made forays into more human territory. According to Vice, two adult males have been spotted in the parking lot, one on the ramp to the empty visitor centre and another beneath a picnic table. 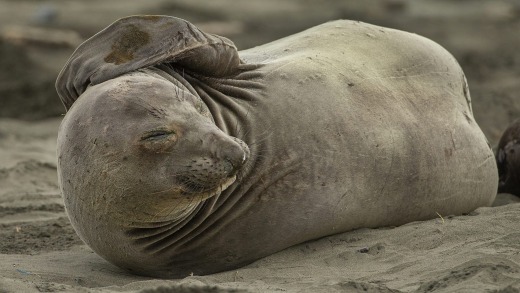 Bulls can weigh as much as 2000 kilograms and, the National Oceanic and Atmospheric Administration warns, "despite their sometimes docile and clumsy appearance, elephant seals can be extremely quick and sometimes vicious if humans, or their pets, get too close." For the humans of Drakes Beach, it might not be a total surrender. 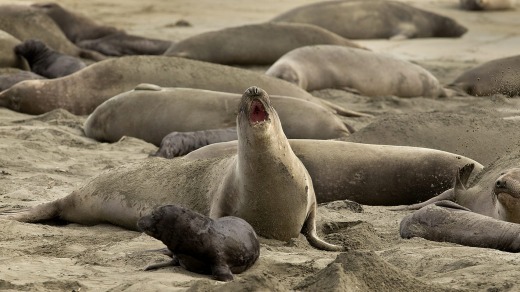 Dell'Osso said staff are exploring the possibility of offering guided tours of the Drakes Beach elephant seal colony. A similar program happens at Ano Nuevo State Park. Visitors who wanted to see the seals at that park are encouraged to bring a warm jacket, water and sturdy walking shoes.